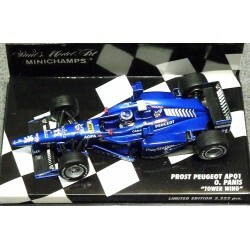 PROST GP There are 8 products. 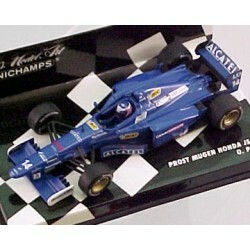 MINICHAMPS scale 1/43rd : Prost Acer AP04 Jean Alesi 2001. 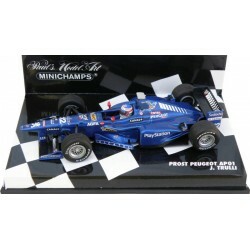 MINICHAMPS scale 1/43rd : Prost Peugeot AP03 Jean ALESI 2000. 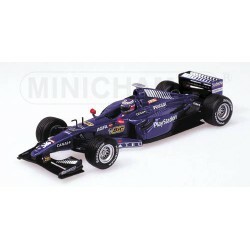 MINICHAMPS scale 1/43 : Prost Peugeot AP02 Jenson Button, 1st F1 Test, Barcelona, December 1999. Limited edition 648pcs. MINICHAMPS scale 1/43rd : Prost Grand Prix AP02 Olivier Panis 1999. MINICHAMPS scale 1/43rd : Prost Peugeot AP01 Jarno Trulli. 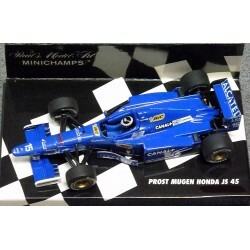 MINICHAMPS scale 1/43rd : Prost Mugen Honda JS45 Shinji Nakano 1997.